Five years ago today, Colin Powell decided to spend all of his credibility to sell George Bush's War. The war John McLovin' wants to last 100 years. A war that costs us more than $100 billion every year (and probably about $2 trillion so far) -- and will cost thousands more dead this year. 1. The Power Point presentation of the world's most dangerous "biochemical weapon labs" that turned out to blow up balloons. 2. 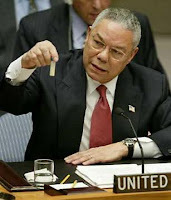 Powell holding up a vial of what he purported to be ANTHRAX (remember that stuff -- and how it was used to sell the war?. In actuality, it must have contained crack. 3. The reaction of our brave, brave Democratic candidates, except Howard Dean. Note the especially wankerous Joe Lieberman's reaction. So, things are getting better? Really? Thanks for Harshing my Mellow Seth Rogan! Why do people hate Hillary Clinton? McCain's Corruption: Let's Hear it for McCheat! "Ya can take yer hat off"
"Say, my Hutu friend, you ever been to Iraq?" "If only my friend Larry Craig were here"